Because who doesn't want to whip up a plaited tiara on the fly? 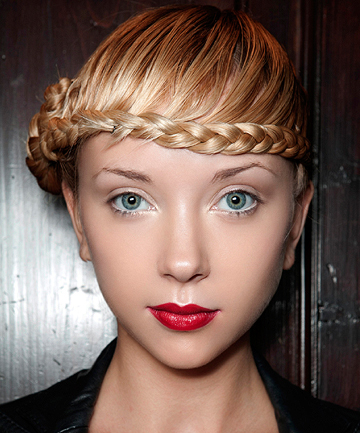 We're just going to call it: There is no hairstyle as versatile as the braid. Whether you're aiming for that relaxed-but-polished updo on your wedding day, or trying to hide your frizz factor beneath its tight coils, the braid always has your back. 1. Crown braids work best on dirty hair that has a bit of grip to it. Employ a braid saver like Kristin Ess Working Texture Loose Styling Powder, $10, to your hair, which should be parted down the middle and separated into two equal halves on either side of your head. 2. Braid each half into a normal, no-frills braid, securing with a clear elastic. 3. Cross each braid to the other side of the head along the line a headband would naturally lie. For a fuller look, lightly tug each loop of the braid out a little; this is known as "pancaking" in braiding circles. Secure each braid with bobby pins. 4. Tuck in any stray hairs, or pull out a few if you're going for a messy look. Set your style with hairspray. That's it! Of course, that's not always it. This is the internet, after all, and Pinterest and Instagram users live for a complicated braid. That's why we've put together 17 of the best crown braids on the web — consider these gorgeous creations your aspirational crown braid inspiration.